11.11.2015 Happy Anniversary to us! Boyfriend, we’ve been through it, haven’t we? Crazy us, wed in a tepee! Buckskin leathers and pretty laces. Goats, turkeys, and a rooster beast. Survived a few wild bashes. A teepee? Would live to hear that story! Congrats. Happy anniversary!!! Whew!!!! 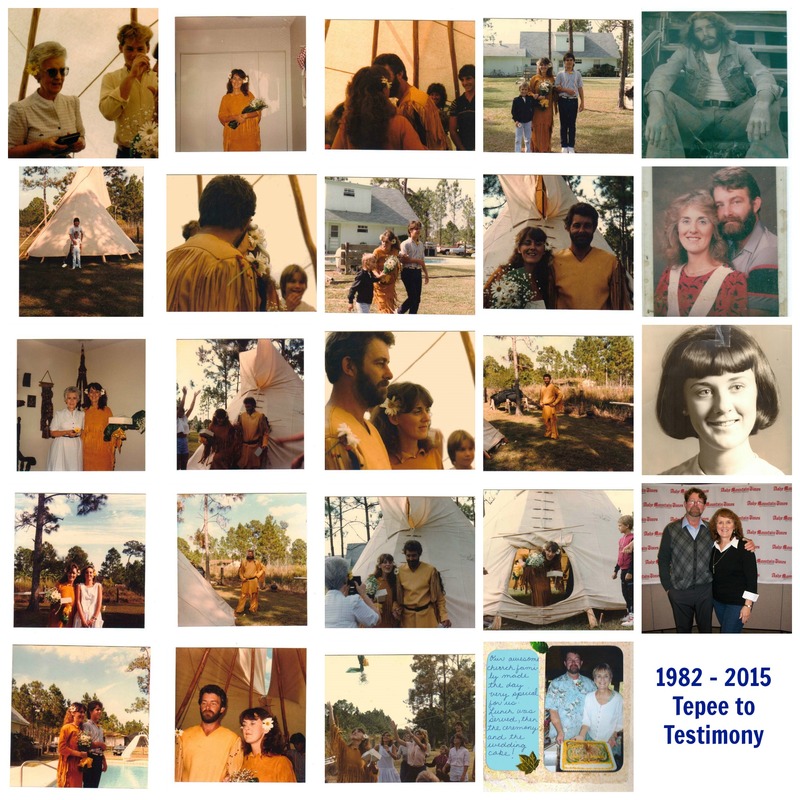 Tepees to testimonies, love that. And, you’ve been a major part of the journey!!! And, that feeling is mutual! And much love in return! What a trip down memory lane! My old backyard and the teepee! Mom looked so young and beautiful. Michael was causing trouble walking you down the aisle (grass) … it was a good day wasn’t it? Memories, some good, some bad but my Father knew each one of them and still watches and knows and laughs and smiles and still dances over us each morning. What a wonderful treat to see these pictures! Some seen before and some are new but all are wonderful! We feel very blessed –It’s so great to have another strong couple to share with in our lives. We look forward to celebrating many more anniversaries with you in the years to come! OH ALI, I PRAY SO! Enjoying the day. I’m at work and he’s at the salon. He will bring home supper in styro boxes because we don’t want to go to eat!!! Happy Anniversary, you are an amazing lady!! God bless! Not sure about amazing but I’ll take the happy wish and the blessing!!! Thank you Crystal for visiting! Happy Anniversary!! Loved the poem. Happy Anniversary! What a sweet tribute! Thank you for coming by and celebrating with us! Beautiful, poetic love language words! We are so blessed by our Heavenly Father with our “good egg” husbands…many blessings to both of you on your anniversary! Yes, they are “good eggs” – not eggheads, but good eggs. LOL Thank you, Beth. It’s a collage, cous, the individual photos won’t enlarge. Love it!!!! It sounds like you’ve had a pretty interesting time of it. Happy anniversary. To say the least!!! Thanks for visiting. Great pictures! Sweet poetry!! Happy Anniversary! Dianne, thank you – poetry isn’t exactly my thing! Happy Anniversary! Love the poem and the photo collage. Hope you enjoyed your day. Happy anniversary! Such a lovely poem and an inspiration that you’re still going strong. I hope my husband and I are as happy when we’ve been together many more years. You’ve given me the idea to write something for him, so thanks for that, too! Sarah, thank you for visiting and subscribing! It is honoring to write something about special people in your life!